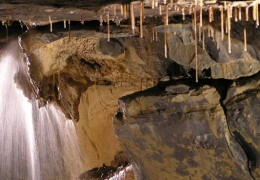 The Burren region is internationally famous for its limestone landscape and flora. The views of the limestone pavement being punctuated by bursts of vividly coloured flora are abundant in the spring. In a landscape were Arctic and Alpine flowers grow surprisingly alongside Mediterranean species and where something is always in bloom you would be forgiven for thinking it’s a botanists paradise. While the spring and summer months see the flowers blooming, it is the ferns and moss that take centre stage in autumn and winter. The Burren National Park provides public access to this special natural landscape and offers a free bus service around the park during the summer months. Visit the information Centre in Corrofin for further details. The Burren Nature Sanctuary Capture the essence of the Burren, wandering through this rock strewn lunar landscape. Visit Botany Bubble – national botanical collection of Burren flora. Identify seasonal wild flowers, butterflies and orchids, explore an organic meadow and a disappearing lake. Creative seasonal café menu. The Burren Perfumery Burren Perfumery make natural and organic cosmetics by hand in the middle of the Burren. Browse the shop, see how the products are made, relax in the tea rooms and explore the herb garden. Wild Kitchen Wild Food is seasonal, local, nutritious and free. Join local guide Oonagh on a journey of discovery as she shares her knowledge and passion for good food. Discover many edible types of seaweed, wild herbs, roots, flowers, fruits and nuts. Offering a wide variety of guided walks though the landscape and the Burren National Park with commentaries on the geology, flora, archaeology, fauna, farming and folklore of the Burren. 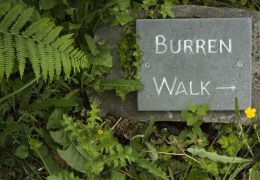 Coisceim Anama, meaning Footstep of the Soul, offer Inspirational Walks in the beautiful Burren. Walkers are given the opportunity to slow things down, take things one step at a time and awaken the senses. Explore the stunning Burren National park and Mullaghmore mountain with expert guide Christy Sinclair. Mullaghmore rises to a height of 180 meters (627ft) and offers panoramic views of the surrounding area. Photo opportunities a plenty! The landscape is typical of the Burren, limestone pavement, packed with fossils, between which grow a unique range of flowers. 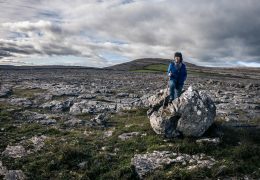 Your guide will inform you of the flora and fauna of the Burren and offer a glimpse into the past lives of people who lived on this land thousands of years ago.